Recently I was at an event that was attended by some of the super rich of Brazil. I, unfortunately, am not one of them but got to brush shoulders for a short while. Inevitably the conversation moved to the upcoming presidential election here and the World Cup. I don't understand enough about politics here to get too involved in the presidential discussion, and while I understand less that I should about international football, I am going to get involved in that discussion. Because it's about more than football. The people I talked to at the event were all leaving for the month-long Cup (June-July). They were heading to Europe or the US or just elsewhere. Why? They said it would be a gigantic mess, dangerous with protests and a complete embarrassment for Brazil. By the way, others I know who are not super rich are also leaving during the Cup--but only because outgoing flights are cheap and school holidays will last 8 weeks in some cases. I am staying. Enthusiastically. I can't wait. I am going to dress in yellow and green for a whole month (except on days when Uruguay plays and then all bets are off--kidding, BH, kidding). I have no idea what goes on during the game--okay, I admit I am in training for the Cup studying Falcao (oops, he has about a 50/50 chance of coming), "gol de placa" and a large list of swear words. This morning I got a link from a NGO where I used to volunteer. In the clip, there is a TV journalist talking about how no Brazilian should volunteer for the World Cup. That it is a FIFA event, money is going not into the pockets of those who need it and that you'd have to be a clown to want to work there for free. And this is where I completely disagree. No, not with the point that FIFA is the organizer and that they come away with most of the money. 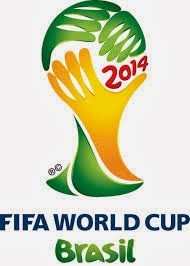 My point is that now, at this moment, the World Cup is not FIFA's. It is Brazil's. It is Brazil's to win, both on the field and off. Brazil can win new fans of soccer and of this wonderful country. Or it can piss it away along with all of the money that was supposed to go to infrastructure projects. The fact is that it is too late to say "we should never have gotten the Cup." I remember the announcement of it being in Brazil. The country celebrated. BH and I looked at each other and frowned. Did anyone really think that infrastructure (hospitals, schools, etc) would be built as promised? Really? No one here is that naive. Or that optimistic. But it's too late. It's coming in four months. The fact is that it is too late to demonstrate about the money going to stadiums and not to the residents. That money is gone. And will be more gone soon as some of the stadium projects go into overtime and money is dumped into repairs (São Paulo), grass (Curitiba) and canvas airport terminals (Fortaleza). If I could counsel the protestors, I would say find a new way. Let's not accidentally kill more videographers like in Rio last week--that does not help the discussion. Let's not scare the tourists away. The fact is we need some of this money back. That means we had better convince people from abroad to come to this Cup. I want them to spend weeks here. I want them to visit deserted beaches, national parks, city museums and restaurants. I want them to love Brazil. There is a lot to love. As I've said before, I fell in love with a country during a World Cup. I have been back to that country three times since then and spent lots of tourist money. I tell everyone to go there for wonderful people, food, adventures. That country is South Africa. I also lived in the US during the World Cup there in 1994, and in San Francisco where the Brazilians were based. It is an indescribable event--so much intrigue, so much theatre, so much fun. For an American, we cannot grasp the emotions at play--the deep-rooted need to win. I was here in Brazil during the 1998 Cup. I cannot tell any of you what it is like to be in a country that STOPS when its national team plays. It stops. São Paulo, population who knows but close to 15 million, stopped. Not a bus on the street. Not a person on the street. I could have laid down in the middle of Avenida Paulista and taken a nap--not one car. And then a goal and the place explodes with happiness. So, I'm staying. I'm staying to support the athletes who have trained for years to be on this or that field (really hope Curitiba gets some grass for it). I do not promise to not call them babies when they grimace and roll on the ground when someone touches them (Italy, this means you). I do not promise to like Ronaldo or to cheer against Argentina (close your eyes, BH). But I promise to welcome all the tourists who come here and help them however I can. I want people to love Brazil. And start a lifetime love affair that will bring them back again and again. Does anyone remember the lines in Apollo 13 about success and failure? One of my favorite movies of all time (here is the link if the movie doesn't come up: http://youtu.be/eOkAyUmyQko. We can choose: believe this could be our biggest disaster, or believe it will our finest hour. I know which one I choose. Fala, Kris, parei aqui por um link no FB. Muito bom ver um comentário lúcido sob a ótica externa. Nossos fantasmas estão tão entranhados que mal conseguimos ver além do fog! Depois de nove anos aqui, tambem tem muito fog para mim. Mas umas coisas não colam... e quero muito que o Brasil se saia bem na Copa (e não nos jogos...bem, okay, tambem). Obrigada pelo comentário! Good thoughts, and well said. I'm not sure how I feel about the call for volunteers, but I really hope this goes better than I've been imagining, either way. I agree that there is a part of the call for volunteers that rubs the wrong way after billions are put into pockets that don't need more. But in the end, I would definitely volunteer in the US in a similar situation--and I had several friends who did during the 94 Cup. I hope it goes better too. We deserve it.